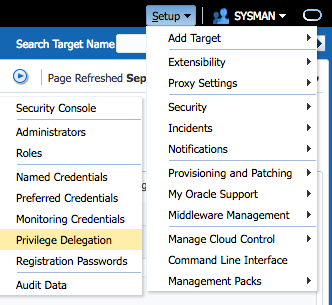 Cloud Control – Privilege Delegation – so you don´t have the oracle / root password? 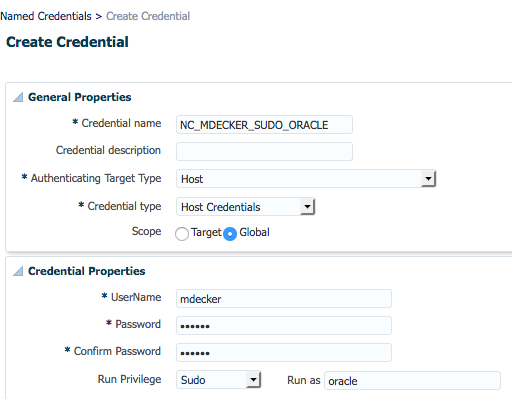 Quite frequently in database environments, security policies dictate that only personalized logons to Unix / Linux are allowed and that from there, one has to “sudo” to change to the oracle account. While this adds an additional layer of security, it makes administration a little more complicated. Oracle Enterprise Manager – Cloud Control has a feature, which allows to cope with such a sudo environment. The feature is called “Privilege Delegation”. This post describes how to set it up and for what it can be used. In addition to this one, two additional rules are required. If only sudo to “oracle” is required, then only the first line is needed. Go to Setup -> Security -> Privilege Delegation. The next step is to configure a Named Credential. If you are in a team of administrators, then each administrator should have his own account to log on to Cloud Contol and avoid using “sysman” user. For obvious reasons, each administrator has to create his own “named credential” (Setup->Security->Named Credential), because it contains his personalized username and password. Here you provide your personalized credentials (username/password) and specify that sudo should be used to change to “oracle”. Lastly, verify that it works as desired. Go to “Targets” -> “Host” and click “Run Host Command”. 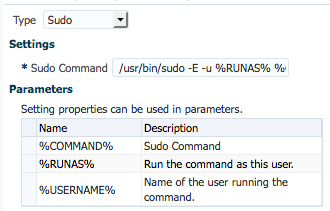 Then give the command to run, e.g. “id -a”, and then add a named credential as well as a specific host and click “Run”. If all is well, then you will get this output showing you the id of user oracle. How does this work behind the scenes? The agent java process spawns a process “nmo”. This process was granted SETUID root Privileges by executing $ORACLE_HOME/root.sh at the time of agent deployment. This executable is calling “sudo” to run command “nmosudo” as user oracle with the “payload” command, which the user wanted to execute. The linux logfile /var/log/secure will contain this messages. It can be seen that the personal user “mdecker” was running the command “nmosudo” with the payload command “id -a” as attribute.